Sorry for my silence during this month. I barely had time to update this blog because i had so much going on. Well i guess it's better than not doing anything at all. Anyway, i had a coup'la wedding gigs under the ever so talented photographer, Mr. Glenn Tumaneng *as always :)* Super glad to be a part of his team! Buuuut, i wanna rest from posting wedding pictures as of the moment. Hihi. I had a couple of photo gigs i did alone, some fun company event, childrens' parties and others that i'm dying to sort, edit, and upload for me to share to you guys! 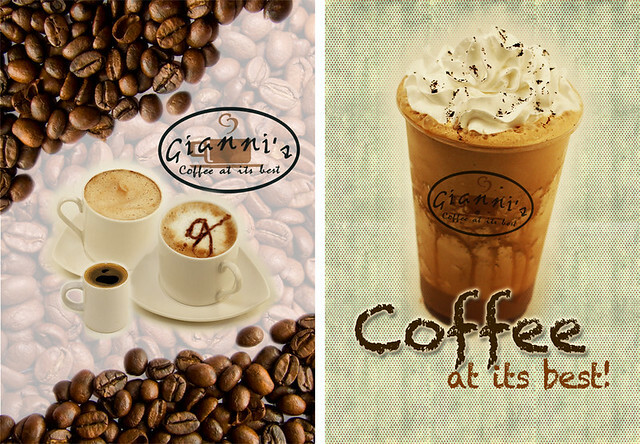 For now, here's an update about my project with Giannis Coffee. At first, all i thought was that i was tapped to shoot their yummy drinks and design their menu. It was way better than that! I was requested to design some posters for their shop. I hope they frame it or post it against the glass wall..other than that, i can not wait to see 'em displayed! I had them printed out this afternoon at Crown Printers and we delivered it just a couple of hours ago + we also had a little caffeine fix. Well, i did. My momma and cousin had Green Tea Freeze. I hope you'll like these posters because i really enjoyed designing them. 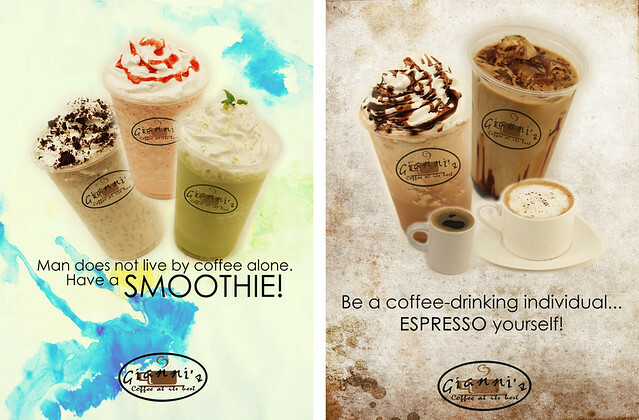 Have your caffeine fix at Giannis Coffee now!